100% FREE: Use This Simple Software To Make Your Customers To Buy More Products And Increase Your Online Sales Instantly! The 1ClickUpgrade Software allows you to instantly “bump up” the revenue potential for EACH sale without you needing much effort on your part through instant upsell. And if you’re not including any upsell in your marketing, then you’re just losing out the additional revenue that you can have. Now you can ensure your upsell integrates seamlessly with your initial sale so that you can get your customers to pay you more without trying to sell to them. 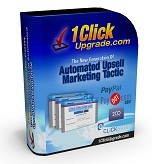 The 1ClickUpgrade Software works with 99% of any payment system and affiliate program. It's easy to use with a simple interface and user-friendly setup. But more importantly, it automatically increases your sales with upsells. Super fast -- It'll take you less than 2 minutes to create a new upsell for your internet business- fill in the blanks for your campaign name, marketing message and your order link. That's it! You're ready to add upsells on your websites. Super user-friendly -- Don't know any programming? No problem. You can integrate the upsell into your webpage by simply copy and paste! The system will automatically generate a code for you that you can just paste onto your website to include an instant upsell. Add any offers you like -- There's no restriction to what kinds of upsells you can do with 1ClickUpgrade! You can allow your free members to buy a paid product, get existing customers to add more products that they wanted to buy, add free 30 days membership before checkout and so on. The limit is only your own creativity. Instant profit calculation -- Instantly analyze the extra profit you have made by including an upsell on your website! You can easily check how much profit you have made with our exclusive built in calculator. Free Maintenance -- You just go on making more sales for your business while we take care the technical stuff for you. Hosting compatibility, system installation, technical glitches and so on - we'll take care of those boring stuff. The system is hosted on our dedicated server where we have our support team to do the maintenance all the time. If you're an affiliate marketer, there's actually a tricky tactic to use 1ClickUprade to make more money online automatically! So if you're concern that you do not have your own product to get the most out of this unique upsell marketing system, you don't need to worry about that - at all. 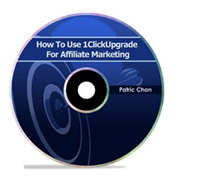 1ClickUpgrade is suitable for affiliate marketing too. Listen to this audio course and you'll see how you can literally change your affiliate marketing model to get more affiliate sales and you'll discover how you will be able to win the affiliate marketing game -- beating the other affiliates flat. The best way to ensure your long-term success of making money online is to always stay updated with the latest marketing strategies and be able to get support. 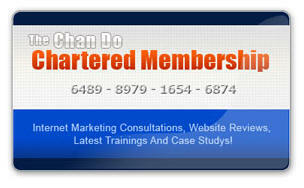 With the monthly Chan Do Chartered Membership, each month, you will receive quick tactics, case studies and internet marketing strategies based on real life results and observations -- tested methods to implement in your business to increase your income. Also, each month, you'll get the Consultation Session with Patric directly where you can ask questions, get free website/salesletter reviews, brainstorm ideas and so on. When you get the "1ClickUpgrade" today, you'll automatically get 30 days membership for free. Yes! Please Give Me Free Access To Your 1ClickUpgrade System So I Can Make More Money From My Online Business! DO NOT Uncheck This Or You Will Not Get To Download 8 Valuable Products From The Chan Do Chartered Membership for 30 Days FREE. Be warned, unchecking this could cause you to lose thousands of dollars for not getting Patric’s secrets and strategies of making money online. If you check or uncheck, you'll still get 1ClickUpgrade System for free - checking means you'll get Chan Do Chartered Membership for 30 days free too.